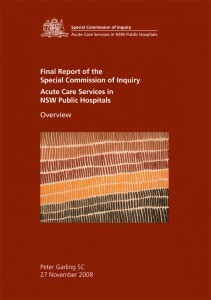 The Garling Report came out of the 2008 Special Commission of Inquiry into Acute Care Services in NSW Public Hospitals authored by Peter Garling, which investigated the standard of patient care in public hospitals and found a “prevalent” problem associated with care of the deteriorating patient. In 2010, the NSW Health Department acknowledged that a new system of monitoring vital signs to detect deteriorating patients was needed statewide. By 2012, every state hospital in NSW adopted the Between the Flags system, implementing the Between the Flags Standard Observations charts and a Clinical Emergency Response System (CERS) that details the process for calling for help and the clinicians who are required to attend. Medical officers, nurses, allied health practitioners (including physiotherapists), and other staff undergo mandatory training to adhere to these standards. The full Garling Report can be accessed here. Nurse Jeff Furolo speaks to a number of prominent figures for the 10 year anniversary of the Garling Report. Garling After 10: Antony Sara.